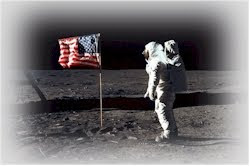 The Coalition to Save Manned Space Exploration: 50th Anniversary of JFK's Challenge: Go to the Moon "In This Decade!" 50th Anniversary of JFK's Challenge: Go to the Moon "In This Decade!" 50 years ago today, President John F. Kennedy challenged our great nation to do the impossible. Not only to go to the Moon, but to do it "in this decade." This was not mere rhetoric, he meant it! And as the world stood still, Neil Armstrong spoke the immortal words, "that's one small step for a man; one giant leap for mankind" just eight years later. As a nation united in a great cause, we did the impossible! His footprints on the Moon will attest to American ingenuity forever. Yet America's space program on this anniversary is in complete chaos. The shuttles are being prematurely retired without a replacement--and leaving the US subject to pressure or blackmail by the Russians on foreign policy and other matters to keep launching our crew. Replacing a "tractor trailer" which comes to ISS with a repair and servicing crew as well as replacement ISS crew with a small "sedan" carrying only ISS crew or small cargos is not a "replacement;" it is a giant leap backwards. The fault partly lies in past decades when plans for the National Aerospace Plane--which would have been a true replacement, or even a next-generation but similar shuttle--were cancelled; and partly with the Bush and Obama administrations for retiring the shuttles before any US launch vehicle was ready; and additionally with underfunding and delays in building replacements. Unknown to many is that each orbiter was designed for 100 launches, and none flew more than 39 times. The problems which caused the catastrophes with Challenger and Columbia were corrected, and they could have flown until US crew launch rockets were ready. Interestingly, a stopgap solution was rejected by NASA; United Space Alliance had proposed taking over two of the shuttles and flying for five years at less than the current costs (and less than the effective costs of Russian launches). Should wiser heads read this; until Endeavour lands and is dissected for museum display, it is still possible to accept the deal. With the cancellation of Constellation, America has been set back years in the quest to finally have a heavy lift rocket capable of taking Americans back to the Moon and on to Mars. Without a major change in course, we may never have the Lunar base from which we can learn to live on Mars, much less ever land on Mars. We may instead end up watching as Chinese, Russia and others take the lead and rewards. Space exploration is expensive--but so was it expensive in 1961; yet it has always been an investment in our future. The payoff in skilled jobs, inventions, national pride and private investments far exceeds the monetary costs. 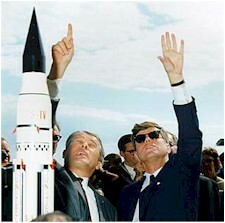 America rocketed to leadership in high technology in part due to the space program launched on this date by JFK. Going to the Moon in 1961 may have seemed impossible and requiring the invention of unknown materials, computers and equipment. Nobody at the time even knew how the human body would react in weightlessness. Yet we persevered as a nation and succeeded, and as a result today we enjoy so many electronic, medical, energy and other discoveries as a result. Imagine the future, where learning how to travel to and live on Mars and the Moon may yield innovations in cheap, clean energy and environmental control. That's the sort of payoff which would benefit every American and enrich our nation--rather then let other countries develop the same technologies and further drain our national wealth. In spite of rhetoric, there is no human space exploration program outside of ISS. Vague plans to go to Mars sometime in the 2030's will never succeed--as is the case for all vague plans. Private companies will very soon offer many spectacular things, from cheaper low-earth-orbit launch vehicles, tourist spaceflight and Bigelow's incredible space station modules. Yet Mars and a Lunar research base will elude this nation until we launch a new deep space exploration program. President Kennedy, on this day in 1961, spelled out both the cause and the solution for today's chaos and collapse in the space program: "I believe we possess all the resources and talents necessary. But the facts of the matter are that we have never made the national decisions or marshaled the national resources required for such leadership. We have never specified long-range goals on an urgent time schedule, or managed our resources and our time so as to insure their fulfillment." Once JFK set the deadline and the American people rallied to the challenge, we succeeded beyond our wildest imaginations. Today, with no "urgent time schedule" and merely spending money on studies or projects which get cancelled without "managing our resources and our time so as to insure their fulfillment" we have essentially nothing to show for all the billions spent over the last few decades on all the cancelled next generation shuttles or rockets. This must change for America to remain a great, prosperous nation; lest we sink further to second-class status in the world, merely watching as other nations seize the opportunities and reap the rewards in national wealth, technology, jobs and pride. That would precipitate a depression from which this nation might never recover. On this, the 50th anniversary of JFK's challenge to go "in this decade" to the Moon, let us re-launch a bold, new space program which will again lift our spirits, and mankind's future to the stars.